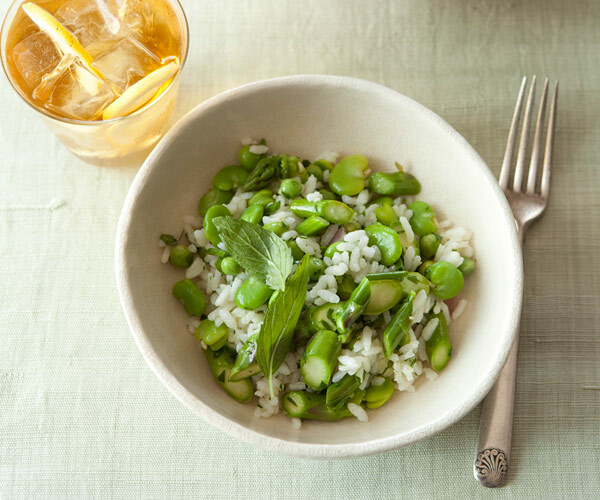 This salad is a celebration of spring, with tender asparagus, fava beans, and peas dotting the chewy grains of rice. It’s best to boil the rice in lots of boiling water for salads, like pasta. This way, the grains stay separate and are less apt to turn into a pile of mush. Cook the rice until just al dente and spread it out to cool. 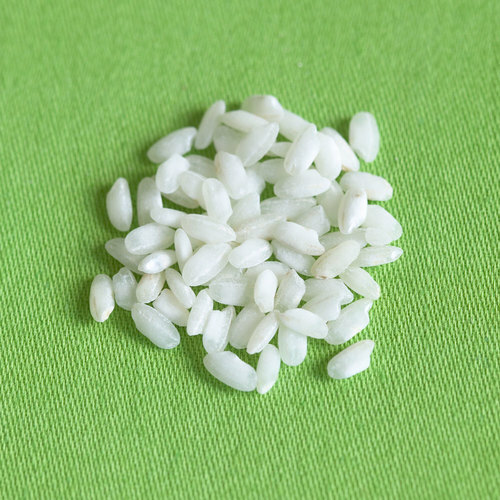 Be sure to serve rice salads at room temperature; cold rice is hard and unpleasant. Bring a large pot of water to a boil and season with salt—it should taste almost like seawater. Add the rice and boil until the grains are just cooked—they should be slightly al dente—about 15 minutes. Drain well and spread the rice on a baking sheet to cool. Set aside at room temperature. 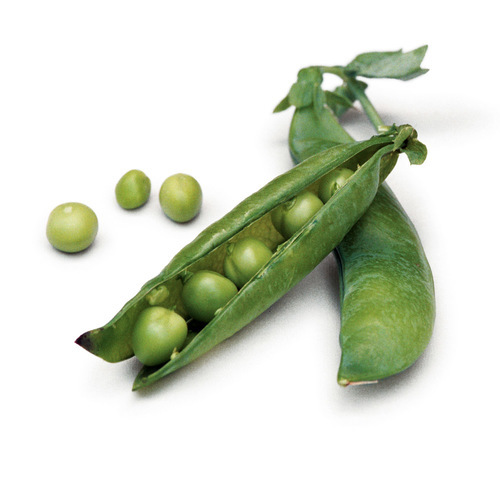 Bring a separate large pot of water to a boil to cook the peas, asparagus, and fava beans. Have a large bowl of ice water ready, and start with the peas. To make this task easier, put the peas in a fine-mesh strainer basket, and submerge the peas and the basket in the water until the peas are just tender, about 2 minutes. Lift the basket out of the water and immediately submerge the peas (still in the strainer basket) in the ice bath until chilled, about 1 minute. Lift the basket out of the ice water and drain the peas well. Transfer the peas to a small bowl, and set aside at room temperature temporarily, or refrigerate and return to room temperature before using. Repeat the process with the asparagus, cook the asparagus in the strainer basket until just tender, about 2 minutes, then immediately submerge the asparagus in the ice bath until chilled, about 1 minute. 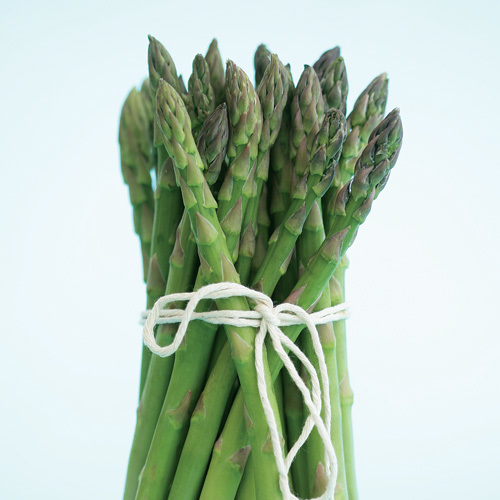 Lift the basket out of the ice, drain well, and transfer the asparagus to a small bowl. Set aside at room temperature, or refrigerate and return to room temperature before using. If necessary, add more ice to the ice bath. Put the fava beans in the strainer basket, and submerge in the boiling water until the beans slip easily out of their skins and are tender, about 2 minutes. (To test the favas, carefully remove a bean from the basket and pierce the outer layer with your thumb, gently squeezing the bean from its skin.) Immediately submerge the beans in the ice water until thoroughly chilled. Pop the beans out of their skins, and set aside temporarily at room temperature, or refrigerate and return to room temperature before using. To make the vinaigrette, combine the shallot, lemon juice, vinegar, and a pinch of salt in a small bowl. Let sit for 5 to 10 minutes. Whisk in the oil. Taste and add more salt if necessary. Shortly before serving, put the rice in a large work bowl, and toss it lightly with your fingers to fluff the grains. Add the vegetables and herbs, and season with salt and a few twists of black pepper. Drizzle the vinaigrette on top and toss lightly to combine. Taste and add more salt, lemon juice, and/or olive oil if necessary. Transfer to a shallow platter or individual serving plates. Serve at room temperature. 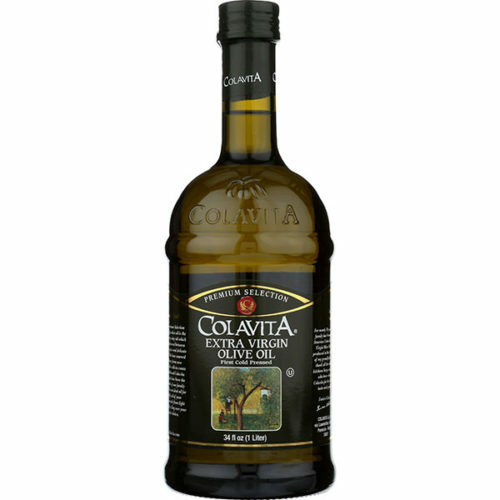 Serve with shrimp or salmon, chicken or spring lamb, or not-so-hard-cooked eggs sprinkled with salt and pepper.